Realme today finally launched its latest Realme 3 smartphone in India. Now, when it’s finally official, we now have the full details about the phone including its specifications, price, and availability. Now, let’s talk about the main highlights of the Realme 3. The latest smartphone from Realme features a 6.22-inches Dewdrop Screen, Helio P70 processor, 4230mAh battery and a vertically staged dual rear camera on its back. Now, let’s check out the Realme 3 full specifications, Price and Availability. The new Realme 3 features a 6.2-inches HD+ Dewdrop Notched Screen. The phone is powered by an Helio P70 processor and Mali-G72 GPU coupled with 3GB/32GB + 4GB/64 RAM and storage options. The phone runs on ColorOS 6 based Android 9 Pie out of the box. On the camera side, the Realme 3 features a dual 13MP main sensor and a secondary 2MP vertically staged rear camera setup. Up front, there is a 13MP camera. The rear camera on the Realme 3 also features Nightscape mode for low light photography. The phone also features a dedicated fingerprint sensor at the back and a 4230mAh battery, there are no words on fast charging. However, Realme dose claims that the Realme 3 battery can last more than the Redmi Note 7. Realme showed off at the event that Realme 3 can last for up to 7.6 hours playing the Free Fire game, compared to the Redmi Note 7’s 5.6 hours play time. Realme also claims that Realme 3 is the best gaming phone under the mid-range price segments. Players of the Free Fire will also be able to win a Realme 3 device with a new and upcoming exciting update on March 31st, 2019. 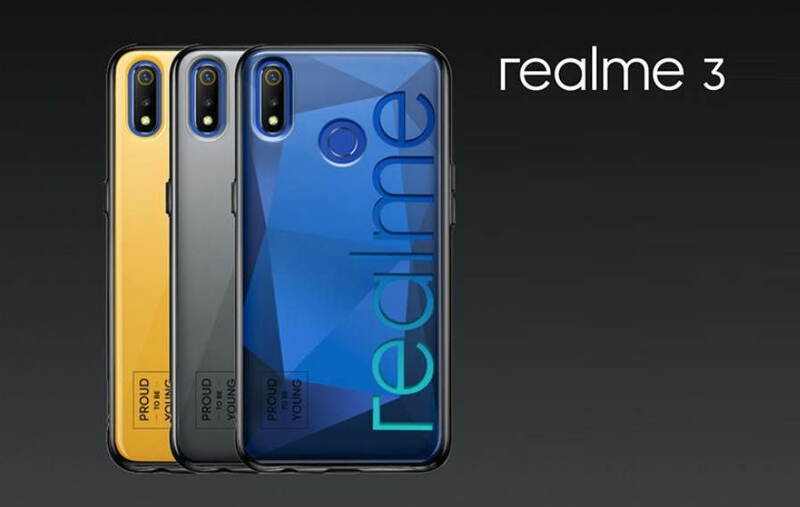 Most notably, Realme at the event announced that all the Realme devices will be upgraded to the Android 9 Pie and ColorOS 6.0 by the first half of 2019. 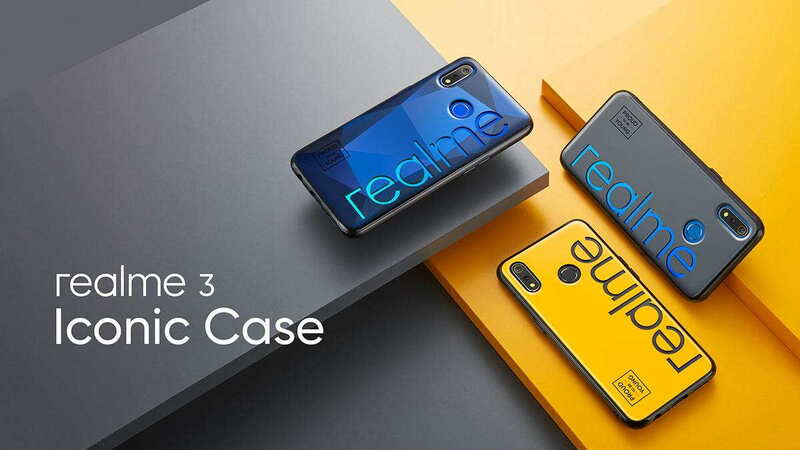 Realme has also launched three new Iocnic cases for Realme 3. The new cases will be available priced at Rs. 599 from the Realme.com. The case will be available in Black, Yellow and classic diamond Blue. The Realme 3 is priced in India at Rs. 8,999 for the 3GB RAM and 32GB storage, while the 4GB RAM and 64GB storage variant have been priced at Rs. 10,999. Realme 3 will be available in Radiant Blue, Gradient Green, and Dynamic Black color options and will go sale in India exclusively on Flipkart starting March 11.